You are currently browsing the archives for the KKK category. Ben Ament’s monthly column is one of the worst monthly columns they’ve ever published. Some of the assumptions made are ridiculous or far-fetched. For instance, Ament wrote that “The erectors of the Confederate monuments were white-controlled governments in mostly southern cities. These men knew full well that the monuments would intimidate the people of color who walked by them every day.” I’d challenge that, if for no other reason than the fact that minorities would’ve been too busy worrying about racists like the KKK and the bigots, mostly Democrats, who wrote the Jim Crow laws to worry about statues of dead people. It’s also quite likely that they were worried about raising their families or grateful for being able to attend inspirational churches to worry about dead generals. But some of these acquaintances want me to remove my blinders and see the response from the left of the political spectrum as somehow the same as or worse than that from the right. 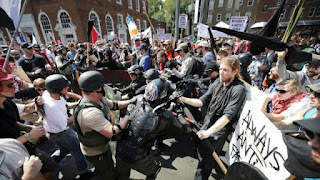 They ignore the swastikas and Confederate flags, torches and clubs carried by the so-called alt-right meant to provoke anger. Standing behind the cross of Christianity while doing so is doubly troubling. It seems, for some, the only reason for being kind and loving to another human is to get into heaven. If this is so, then the point of Christianity has been lost. I guess it is white privilege to define your beliefs as you see fit. Mr. Ament is a totally ill-informed. Christians know that they can’t earn their way into heaven. Being nice to people is the right thing to do but that won’t get them into Heaven. Those who led a rebellion against the United States for the express purpose of continuing to enslave human beings for monetary gain should not be honored. None of the statues in question were erected before or during the Civil War.